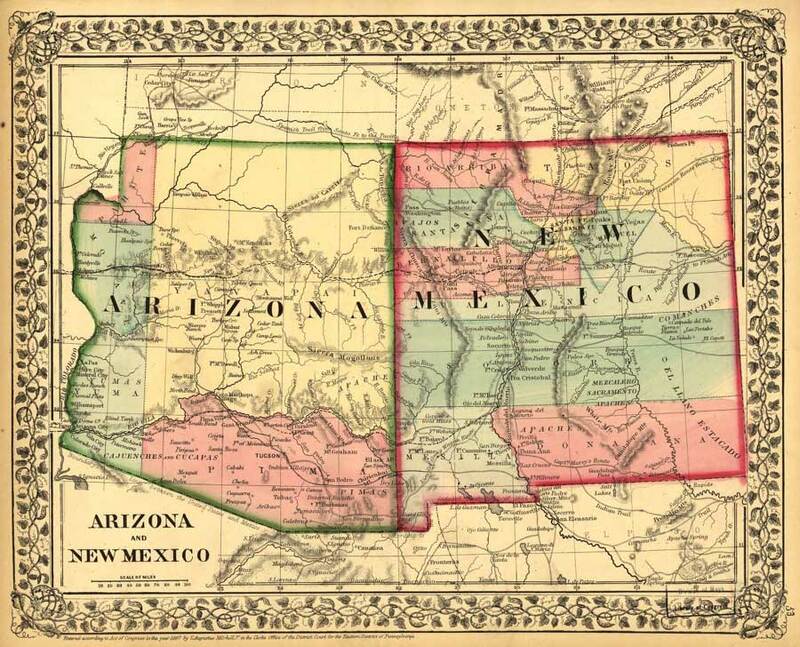 This beautiful map of Arizona and New Mexico was produced by S. Augustus Mitchell in 1867, probably as part of Mitchell’s New General Atlas published by his company (this is not stated in the Library of Congress notes on it, but is the same map used in later volumes of the atlas). 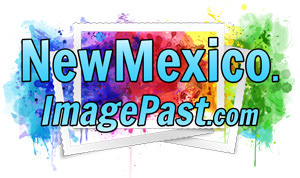 In addition to counties and towns, the map notes Native tribal territories and pueblos, Indian and Spanish trails, military routes, and wagon and caravan routes. Mitchell’s hand-colored maps were known for their pastel colors, vine borders, and detailed geographical features. Maps and atlases were big business in the 19th century, and the Mitchells were one of the leading map publishers of the time. The firm was established in Philadelphia by Samuel Augustus Mitchell, Sr., in the early 1930s. He struck a chord with the public’s new taste for travel, and the company’s pocket maps and travel guides were hugely popular, as were their school atlases. Early adopters of steel engraving, the Mitchells produced maps that were attractive as well as accurate. In 1860 S. Augustus Mitchell took over the company from his father and began publishing Mitchell’s New General Atlas, which continued to be produced until 1893. Image Source: "Arizona and New Mexico" [S.l, 1867] Map, (98687198); digital images, "Mapping the National Parks," Geography and Map Division, Library of Congress, Library of Congress Online Catalog (https://www.loc.gov/item/98687198/); crediting "Augustus Mitchell."